POSIC launches the IT5602L linear encoder, which comes in a tiny SMD-format. Resolution and maximum speed are field-programmable and can be set down to 0.04 um and to 10 m/s respectively. The output signals are A and B in quadrature and an Index-pulse that is synchronized to the A and B signals. Thanks to the eddy-current sensing mechanism, the encoder is insensitive to magnetic fields and therefore particularly suited for integration in rotary and linear direct drives, voice coil actuators, solenoids and other magnetic actuators. The IT5602L encoder kit with scales of various lengths and an Evaluation and Programming Tool are available from POSIC’s webshop. POSIC has raised the performance bar of their popular range of inductive encoder kits by releasing a next generation high resolution encoder module – the ID1102L – capable of resolutions down to 20 nm. A programming tool allows field-programming of the resolution as well as several other encoder parameters. 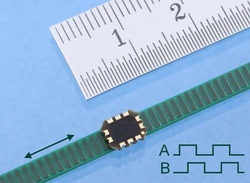 The encoder, which measures only 9 x 6.8 x 1.6 mm, employs an eddy-current sensing mechanism and is therefore robust against dust, particles, oil and liquids. The scale is a printed circuit board with high-precision copper patterns. It can easily be to cut to the desired length, does not attract ferromagnetic particles and doesn’t have to be cleaned for correct operation. The ID1102L encoder kit as well as scales and the Programming Tool are available from stock. POSIC launches the ID1102L linear encoder kit that operates up to 2 m/s with a resolution of 0.6 μm. Both resolution and maximum speed are user-programmable and can be set to different combinations of resolution (down to 0.02 μm) and maximum speed (up to 32 m/s). The encoder employs an eddy-current sensing technology and is therefore not only robust against dust, oil and liquids, but is also insensitive to magnetic fields. The magnetic-field-insensitivity makes the encoder kit particularly suited for integration in linear direct drives. The ID1102L encoder kit with scales of various lengths and an Evaluation and Programming Tool are available from stock. For high-accuracy applications, you can linearize your encoder after it has been assembled in your application, thus eliminating potential inaccuracies due to mounting tolerances. Check this video to see how the linearization works! Need high-resolution position measurement in an extremely small space? POSIC offers the perfect solution with its ultra low profile rotary encoder kit ID1101C ! The overall height, including the encoder’s cable-outlet and the codewheel, is only 2.5 mm. Standard codewheels are available with diameters from 28 up to 73 mm. The resolution ranges from 128 up to 65’536 CPR and can be factory-set or user-programmed. The encoder-head and the codewheel are robust against dirt, liquids, oil and grease. They do not attract ferromagnetic particles and are insensitive to magnetic fields. The codewheel does not have to be cleaned for reliable operation. This encoder is ideal for integration in direct drives, instruments, machines, robots and other applications where space is limited. The rotary encoder kit ID1101C is available from stock. POSIC expands its portfolio of incremental encoder kits with the ID4501 programmable encoder that is housed in a tiny SMD package measuring only 5x6 mm. 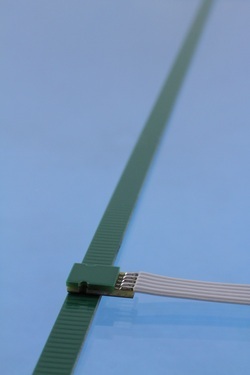 The linear scale is 3.7 mm wide and up to 550 mm long. 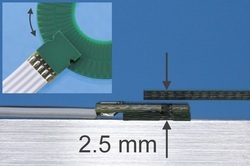 The profile-height of encoder and scale together is below 2 mm. The Evaluation and Programming Tool EPT allows you to program resolution (down to below 0.1 um) and maximum speed (up to 20 m/s) according to your application-requirements. For high-accuracy applications, it is possible to linearize the ID4501 against a reference-encoder and program the linearization data (LookUp Table) directly into the ID4501’s memory. The ID4501 encoder, codewheels, linear scales and the Eval. & Prog. Tool are available from stock. Simplify inventory management and speed up delivery time by using the programmable version of POSICs ID1101C encoder kit. The resolution can be programmed from 128 up to 4096 CPR prior to or even after assembly into your application. The programming tool consists of a PC-based software and an interface board. The software is easy to use and can be downloaded free of charge. 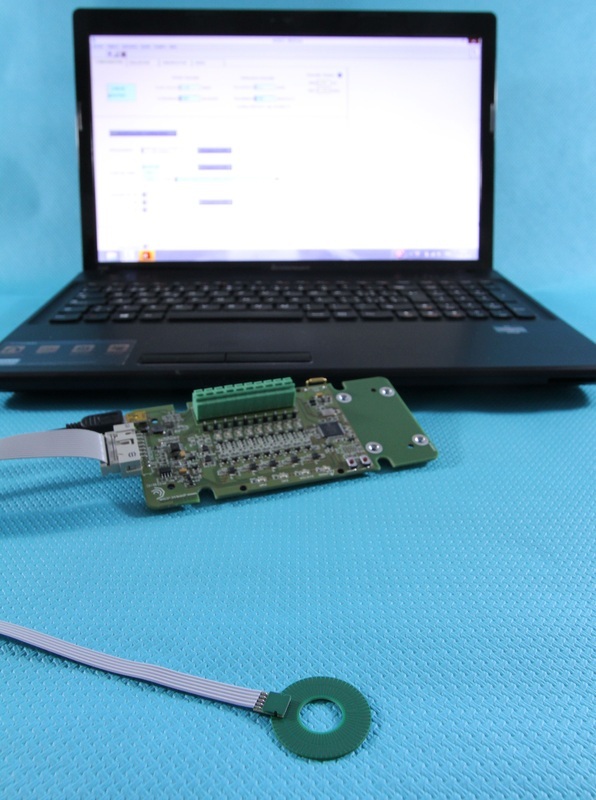 The interface board is connected to the PC via a USB-cable and to the encoder via the regular encoder-cable. The programming tool allows to select the resolution, program identification numbers and carry out diagnostic functions. It is ideally suited for evaluation purposes as well as for production-level programming. POSIC extends the application range of its popular ID1101L linear encoder with an extra long scale. This long scale has a length up to 550 mm and can easily be cut to length. The scale’s width of 4.4 mm and thickness of 0.9 mm match nicely with the very small dimensions of the ID1101L encoder, so it remains a perfect solution for applications where space is limited. 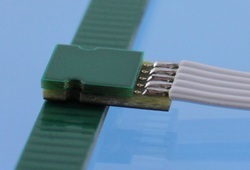 The scale consists of an FR-4 substrate with high-precision copper patterns and allows a resolution down to 0.3 um. It does not attract ferromagnetic dust/particles, is insensitive to humidity, grease, liquids, doesn’t need to be cleaned for correct operation and operates flawlessly inside magnetic fields (e.g. inside an electric motor). The scale is an integral part of the linear encoder kit ID1101L and is available from stock.